After a very tough round robin, the Clearwater Rays were ready to square off against the Natick Knights in the 45+ American championship game. Due to injury and players needing to leave the tournament on Sunday the Rays roster had dwindled to 14 players. However, the desire to win was stronger than ever. 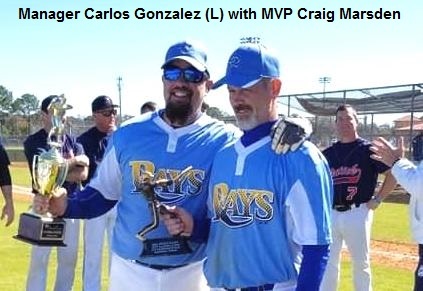 Rays starting pitcher and game MVP Craig Marsden pitched masterfully and also benefitted from some great defense. “As far as I’m concerned Craig was the tournament MVP. 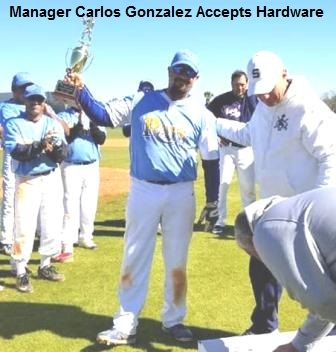 His overall performance was nothing short of remarkable,” said manager Carlos Gonzalez afterwards. On this key at bat Gonzalez ripped a 1-0 pitched into the left centerfield gap for a bases clearing double and the Rays were up 4-0. In the fourth the Rays tacked on another run on a fielder’s choice to make it 5-0. The Natick Knights went to the bullpen and the one and only Doug Flutie took the ball and held the Rays offense in check the rest of the way. The Rays played stellar defense for the majority of the game. Carlos Gonzalez made some sparkling plays at third, including on one occasion leaping as high as he could to snag a chopper and fired a strike to first to get the out. Catcher Danny Mercado displayed his remarkable arm by picking off a runner on third with two outs in the bottom of the fourth. “Every time the Knights had something going the Rays defense and Marsden’s tenacity prevailed,” said Gonzalez. It stayed that way for 8 and 2/3 innings. But with two outs in the ninth and nobody on things became sticky for the Rays. The quote “it ain’t over till it’s over” was quite evident in the bottom of the ninth when, due to some Clearwater Rays misplays on the field, the Natick Knights scored three runs to turn this game into a nail biter. “It got a little scary” stated Gonzalez. 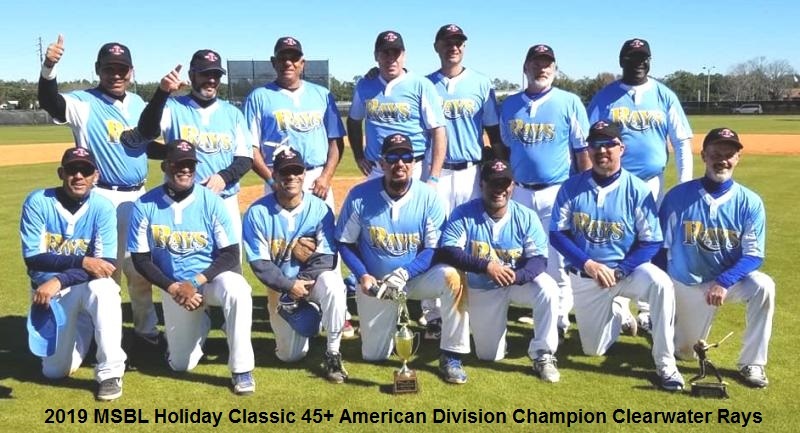 The third out was finally recorded on an infield fly to short stop Rafael Serrano and the Clearwater Rays had secured the 45+ American Championship!